V. cholerae arrived in Haiti 10 months after the earthquake that shook the country in January 2010. By August 2013, more than 6% of Haitians had had the disease, and today it has killed over 9,000 people. 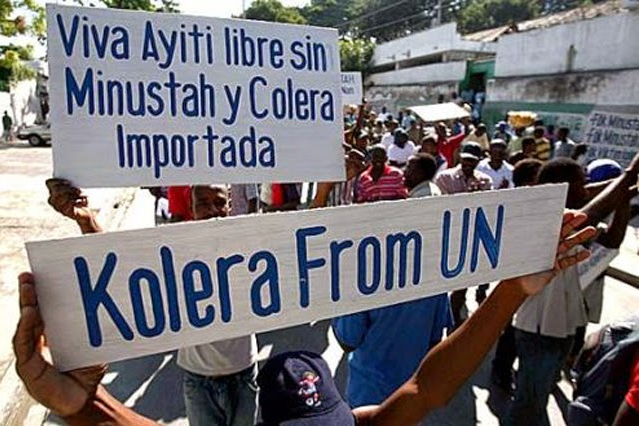 Some sources were quick to attribute the emergence of cholera to the confluence of wet La Niña weather conditions and poor sanitation in the IDP (internally displaced person) camps in which half a million Haitians sheltered, more or less, after the earthquake. Epidemic disease as collateral damage in the shock wave of a massive natural disaster. Yet often sanitation in the IDP camps was better than in surrounding neighborhoods, at least in the immediate post-disaster months – something I think of as the “showcase effect” so common in short-term disaster relief efforts. La Niña weather conditions lead to transmission of environmental strain to humans. This particular strain was transmitted from a cholera-endemic zone, probably in southern Asia or eastern Africa (Piarroux et al. 2011, 2). Meille village hosted a MINUSTAH (UN Stabilization Mission in Haiti) camp, “set up just above a stream flowing into the Artibonite River. Newly incoming Nepalese soldiers arrived there on October 9, 12, and 16. The Haitian epidemiologists observed sanitary deficiencies, including a pipe discharging sewage from the camp into the river. Villagers used water from this stream for cooking and drinking. […] Environmental and water source samples from the same region tested negative for V. cholerae” (Piarroux et al., 2011, 4). The particular El Tor strain of V. cholerae proved identical to the strain linked with an October 2010 outbreak in Nepal: “There was an exact correlation in time and place between the arrival of a Nepalese battalion from an area experiencing a cholera outbreak and the appearance of the first cases in Meille a few days after.” (Piarroux et al. 2011, 9). The United Nations and the World Health Organization, however, deemed the etiology of the El Tor strain of little importance. Reporting for the AP in 2010, Jonathan Katz writes, “A spokesman for the World Health Organization said finding the cause of the outbreak is ‘not important right now. Right now, there is no active investigation. I can’t say one way or another [if there will be]. It is not something we are thinking about at the moment. What we are thinking about is the public health response in Haiti,’ said spokesman Gregory Hartl.” It would seem that the UN prefers to think about how best to manage a massive public health response than how to prevent a public health disaster in the first place. While ¾ of rural Haitians have no access to improved sanitation resources at all, raw sewage from a carelessly maintained MINUSTAH latrine poured into the Artibonite river, the country’s most important water source. The vast majority of deaths from cholera can be prevented by timely access to rehydration, which too was unavailable to the isolated rural communities along the contaminated Artibonite watershed. When I ask farmers what their greatest challenge is in their daily lives and in their work, most reply “dlo” – water. Lapli pa tonbe – the rain doesn’t fall. Or, it falls too much, carving gullies into bare hillsides before it can soak bone-dry fields. The pervasive insecurities that destabilize Haitians’ lives often emerge from water stories. Urban and rural Haitians alike experience a daily struggle to find water to drink, to irrigate crops, to bathe and to cook. Even the elegant denizens of bourgeois Port-au-Prince are sometimes left without water when the big trucks can’t make it up the hills, or the water kiosks run out of clean water with which to fill the big blue plastic bottles. 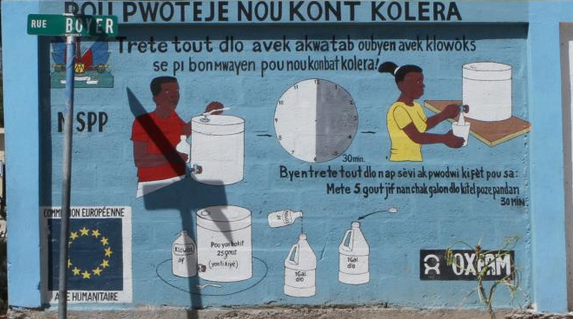 Peasants may walk miles with plastic jugs balanced on their heads only to find that their EU or MINUSTAH-funded water kiosk has run dry, or has been contaminated. They are often forced to drink and cook with water from rivers that flow downstream from the Artibonite, concentrating the risk of widespread contamination. Especially since the cholera outbreak, selling clean – “treated” – drinking water has become a booming business. The small, square clear plastic bags in which water-vendors sell individual servings of clean drinking water litter roadsides and clog canals, compounding sanitation problems. Nonetheless, the WHO reports, fewer Haitians have access to “improved” water sources in 2015 than they did in 1990, and there has been only a 10% increase in access to improved sanitation since 1990 (from 18% to 28%). It is a common trope to attribute the multiple insecurities that destabilize life in Haiti to the fragile state’s troubled integration with the structures of global capitalism. 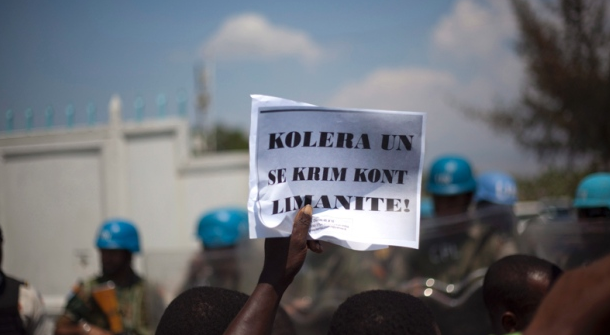 Haiti’s environmental and economic insecurities are no doubt a revealing measure of the global North’s efforts to pacify the Black republic into a docile neoliberal clientelist state. These insecurities, and their management by an array of non-state actors, reveal an ongoing struggle in which the political autonomy of an occupied territory remains at stake, and has been since the 1700s. The popular imagination in Haiti has linked disease outbreaks explicitly with foreign occupying forces before. In the 1980s, when fear of the “4 Hs” inflamed US immigration and public health policy, many Haitians came to believe that the US, and specifically the CIA, had purposefully infected citizens with HIV as a genocidal means of immigration control. I have heard Haitians express similar sentiments about Ebola, fearing that the epidemic has been engineered to target African populations, and will soon retrace the trans-Atlantic route that the slave ships took from the Bight of Benin to the Antilles. While such assumptions may at first appear far-fetched, they nonetheless reflect a reasoned analysis of occupation politics, enacted across multiple scales. There were cholera outbreaks all over the Caribbean between 1833 and 1872, likely fostered by the crowded living conditions suffered by both military and enslaved populations in the decolonizing Caribbean (Jenson & Szabo, 2011). Haiti, however, remained at least nominally independent from the end of the Revolution in 1804 until 1915, when US Marines occupied the country, and, not incidentally, initiated a moral panic and subsequent eradication campaign around the syphilis so often suffered by occupying soldiers (see geographer Tish Lopez’s work for more on the biopolitics of syphilis during the US occupation). It would not be overstating the case to characterize the entirety of Haiti’s 20th and 21st century history as one of foreign occupation. Jenson and Szabo (2011) claim that “In the contemporary epidemic in Haiti, influxes of international soldiers from cholera-endemic areas, who lived in barracks-style housing, present an unexpected parallel to the 19th-century risk factor of new colonial enslaved or military populations living in crowded conditions.” Since MINUSTAH’s arrival in 2004, the “peace-keeping” force has become a ubiquitous mechanism of social and political control. Before and after election days, roads are lined with the blue helmets and rifles of Guatemalan, Brazilian, and Jordanian UN soldiers, and white UN jeeps proliferate across the country. Al Jazeera reports the words of Dr Jordan Tappero, lead epidemiologist at the CDC, “the main task now is to control the outbreak, not to look for the source of the bacteria. We realise that it’s also important to understand how infectious agents move to new countries. However, we may never know the actual origin of this cholera strain” (2 November 2010). By 2011, however, the origin of V. cholerae El Tor was in fact known, traced to the very soldiers tasked with maintaining order and security in an unstable, perhaps failed, state in a condition of seemingly permanent “democratic transition.” On the macro-scale, the UN was doing its disciplinary duty, white jeeps patrolling the highways and the slum, dogs and rubber bullets and tear gas ready to pacify frequent street protests, and docile candidates lined up by the score to populate elections that I suspect are largely conducted offshore. Although election posters and political graffiti have newly covered walls that once carried public health warnings, V. cholerae is still here. Billions of earthquake aid dollars now line international pockets as allegations of widespread fraud begin to swirl anew around Haiti’s most recent round of elections. Blue helmets mark “hot” zones and white jeeps hurtle up and down rocky country roads. Occupation, immunity, eradication: once again, political ecology is not a metaphor.